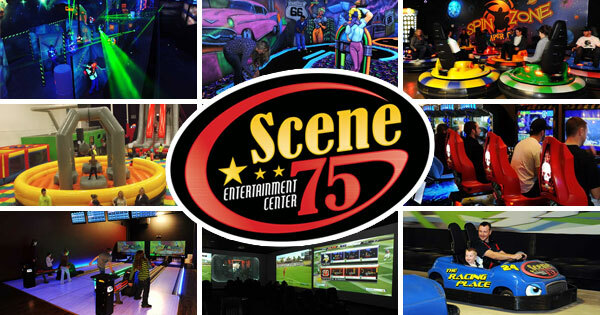 Scene75 Dayton Named One Of The Top Three Family Entertainment Centers In North America! Scene75 Entertainment Center was once again recognized on the international stage! The International Association of Amusement Parks & Attractions (IAAPA) has listed Scene75 Dayton as one of the Top Three Family Entertainment Centers (FECs) of North America in 2015. IAAPA is the largest association of amusement facilities worldwide, with member facilities including: family entertainment centers, amusement parks, theme parks, water parks, and other entertainment destinations. The top FECs were judged based on a visit performed by a professional mystery shopper, the value that a facility adds to its community, and an application PowerPoint presentation. A panel of seven judges, including two past Top FEC winners, evaluated the application PowerPoint and Scene75's community programs, initiatives, & events. It was through this judging that Scene75's Dayton location was selected among thousands of family entertainment centers to be one of the Top Three FECs in North America. Scene75 would not be in this position if it wasn't for all of the support that it has received from the Dayton area since it first opened its doors in July 2012. Jonah Sandler, Scene75's Chief Entertainment Officer, often says, "It takes a community to build Scene75, but it takes another one to support it". Therefore, being recognized as one of the top FECs in North America is not only an achievement for Scene75, but also an honor that can be a source of pride for everyone in the Dayton community.